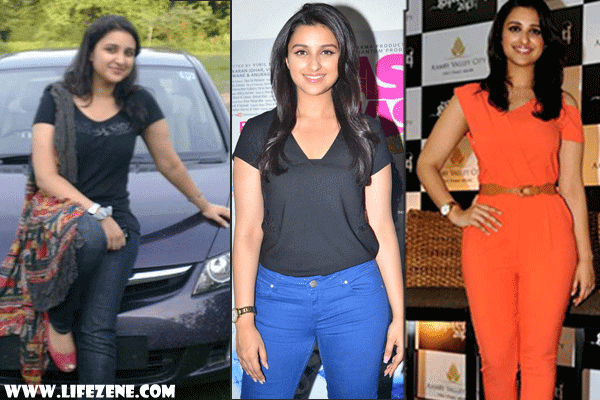 How Did Parineeti Chopra Lose Weight with Diet & Exercise? Everyone was stunned with Parineeti Chopra’s weight loss transformation as she has lost oodles of weight by dropping from size 38 to 30 within just a few months. She debuted with the movie ‘Ladies vs Ricky Bahl’, but rose to fame with her next movie ‘Ishaqzaade’ with Arjun Kapoor. Despite the fact that she has a superb acting talent, it is her body weight that leads to many problems. The main problem with her overweight is that she is not able to wear the fashionable clothes like her counterparts. Since, Parineeti Chopra is a film actress where looks and physique is everything, she has decided to shed those extra kilos and here is Parineeti’s complete weight loss journey. Also see how other Bollywood actresses like Sonakshi Sinha, Sonam Kapoor, Bhumi Pednekar and Zareen Khan lost weight. You can also lose weight by following the 7 day GM diet program. How did Parineeti Chopra Lose Weight? Did She Undergo any Surgery? Before entering Bollywood, Parineeti used to be fat and weighed around 86 Kgs, which is quite heavy for a normal person. The main reason for her obesity problem is her poor metabolism. She is fond of junk foods just like everybody else. Parineeti has openly admitted that she loves to eat Pizza, Burger etc…more often and even said that she can’t imagine living without them. Because of the high calorie food consumption, Parineeti Chopra has put on so much weight and she had finally decided to get back into shape. According to the reports, Parineeti Chopra has spent nearly 10 lakhs on a detox program in Austria. Under this program, the patient will have to undergo several tests which help them to chalk out the foods that the person can and can’t tolerate. After getting the results, they’ll design a diet program, which should be followed for at least 6 months to lose those additional pounds safely. P.S: Parineeti Chopra didn’t undergo any weight loss surgery and just concentrated on eating a balanced diet along with workouts in her routine. 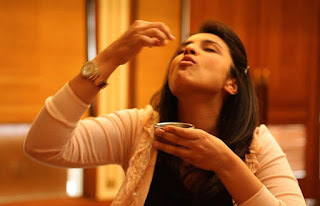 The first thing Parineeti did was to cut down all the junk food from her routine. She loves to eat Pizzas and Pasta, but to lose weight she decided to stay away from such high calorie foods. This ensured that she is not putting any additional calories, which may ruin her weight loss results. Here is a sample diet plan that Parineeti Chopra follows religiously without fail. She always ensures that she finishes her dinner at least 2 hours before getting to bed. The Dawat-e-Ishq actress also drinks a lot of water as it helps in cleansing. Losing weight can be achieved through diet, but to maintain the lost results, you need to a proper exercise regime. Including exercise along with proper diet will not only speed up your weight loss results, but also helps in tightening your loose skin occurred due to sudden fat loss. Here is a sample workout routine of the Kill Dil actress. She starts her day with Jogging for 10 minutes. Occasionally, when free, she also includes her favorite activities like Swimming, practices Kalaripayattu (a martial art form in Kerala) and horse riding as they help in burning more calories in less time. How Much Weight Did Parineeti Chopra Lost? She used to weigh around 86 Kgs and wear size 38 jeans before she started her weight loss journey. But, now she is able to fit into a size 30 jeans. Parineeti’s Fitness Funda: Losing weight is a mind game. You need to push and tell yourself that ‘It’s enough, I am not going to be this way anymore’. This is what Parineeti has posted on Social media along with her latest photoshoot for The Juice Magazine. For the last few months, I have been working out and have lost oodles of weight, and became much fitter than before. I am practicing the Kerala martial art form known as ‘Kalaripayattu’ for an hour every day as it helps my body become more flexible and also stronger. I don’t like going to the gym every day as it bores me and so I decided to try the alternate workout methods when I am not in the mood of going to the gym center. I have just reached 70% of my goal and it needs some more time to finish my goal by 100%. 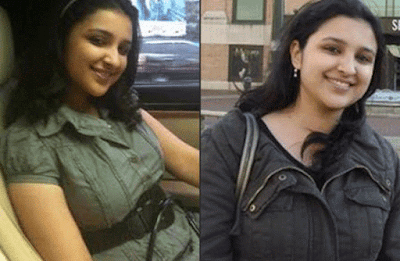 How Parineeti Chopra Looked Before & After Weight Loss? The weight loss transformation pictures of Parineeti have shocked the entire Bollywood. She lost a lot of weight and stunned everyone in a mind-blowing appearance that was featured in the September issue of The Juice Magazine. Previous Post:How to Prepare Green Tea Recipes for Weight Loss?